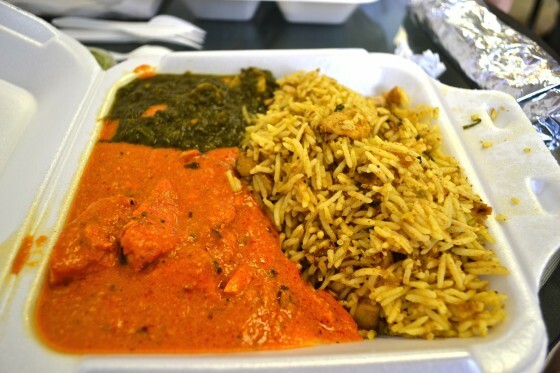 "I received an entrée of Chicken Biryani, with a side order of spinach with mushrooms and butter chicken. The Chicken Biryani – a roasted rice-based dish made with saffron, layered with curry, and marinated chicken – was actually quite good. The rice provided a contrast of flavors with aromatic hints of the curry and had a distinct crackle with each bite. The chicken was also well cooked for the most part. It had a lemon zest that added a refreshing intervention within the roasted rice."